You can’t really dry chanterelles, or so I was told by a guide for the Mushroom Gathering at Breitenbush, a cheerful graying adventurer called Animal. Animal says he dries chanterelles because there are people who want to buy dried chanterelles from him, but the texture is unsatisfactory. 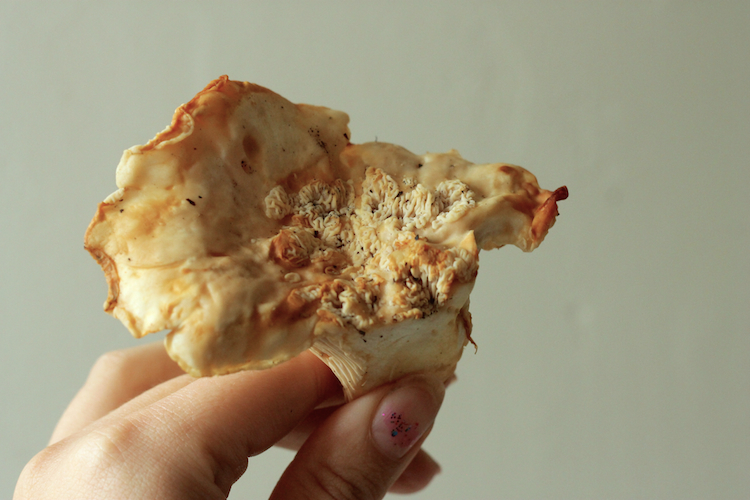 It’s better to preserve these choice mushrooms by cooking them first and then freezing. I’ve never tried drying chanterelles, so I don’t know what they’re like. Last year I cooked some in butter and onions before putting them in the freezer, and they turned out rubbery anyhow. This year Eric went to the Mushroom Gathering at Breitenbush with me. This year isn’t as good of a mushroom year in Oregon as last year. We found several pounds of chanterelles, but most of them had a bit of rot and a lot of water damage. After using a paint brush and sharp knives to scrape and peel away the funky bits, dirt, moss, and pine needles, we had to throw away about three pounds of bio matter. Nevertheless, we still had more usable mushrooms than we thought we could go through in a week. We’d have to freeze the rest. I didn’t have enough cookies sheets to dry roast the chanterelles, so I used a deeper baking dish and a cast iron pan, too. I sliced each mushroom into strips no bigger than one inch to allow enough space for mushroom water to evaporate. Since the chanterelles will be cooked a second time when they are defrosted and mixed into a meal, I wanted to get all the moisture out but I didn’t want to overcook them, or worse, accidentally dehydrate them. I left them in the oven for approximately 20 minutes, or whenever I started to panic that I’d burned them. I didn’t burn them. They significantly decreased in size. So much of a mushroom is water. Even without any oil, they didn’t stick to the baking pans much. 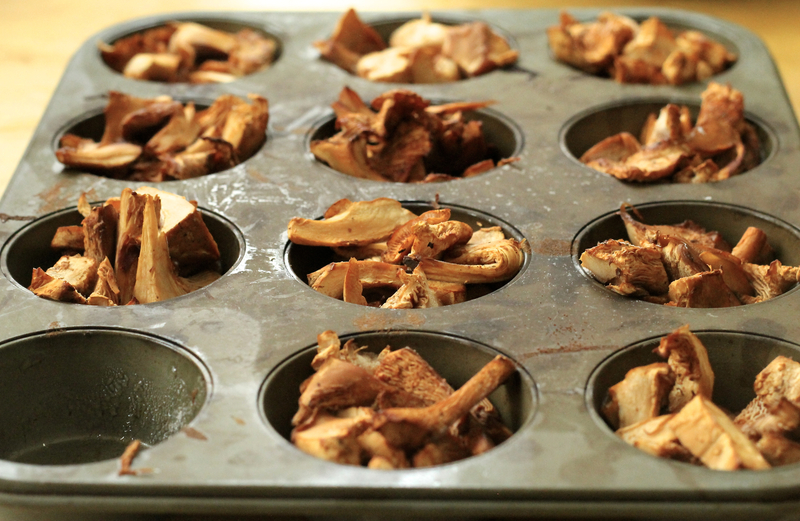 I shoveled the chanterelle bits into muffin trays (a trick I got from The Broken Plow) so they are already in cookable or shareable portions and not one giant block of frozen mushrooms. When the chanterelle pucks were fully frozen, I put them in a more airtight container for longer term freezing. I think they’ll turn out much better this year. How did they turn out???? ?